At the end of March I had officially purchased a house. How do I follow that up in April? Why with a new Motorcycle of course! During the month of April my brother and I took the state sponsored Motorcycle Safety Foundation’s motorcycle safety course at Tri-C. We took it pretty much because it was something to do for a weekend. I mean, we had wanted to take it last year, but never got around to doing it. This year Paul said lets take it and signed us all up so with no effort on my part I was in. Paul, Lori and Rob all too were suppose to take it, but for various reasons (like Paul being a retard on finding places) they missed it. Anyway, Mike and I managed to be at the class on time so we did take the course as planned. It was a fun class. The classroom session was boring of course, but it only made up 4 of the 16 hours so it wasn’t that bad. The range time was the fun part. At the start of the range sessions you pick out a bike and that will be the one you use for the rest of the class. None of the bikes were bigger than 250 cc’s so there was nothing too impressive here. Being ATV riders, Mike and I both decided to go with the dual-sport bikes, a couple of Yamaha TW200’s. They were fun little bikes and the whole time we really just wanted to take them off-road, but to keep from getting kicked out we kept them on the pavement. Still that didn’t keep me from riding them probably a bit too aggressively which I don’t think the instructors cared much for. Anyway, after 10 or so hours of range time we took the final exam and both of us passed. What this meant was we got a waiver card that allowed us to skip the BMV test to get the motorcycle endorsement on our driver’s license. So back to me getting a motorcycle. Well the idea was being tossed around a bit before the class, but after the class the idea became real strong in my head. I really enjoyed riding during the class and afterwards really felt the need to get a bike. I had been discouraged by the insurance quotes I had gotten earlier, but then one day after the class I called up the insurance agency I have my house insurance with and got a WAY better quote. 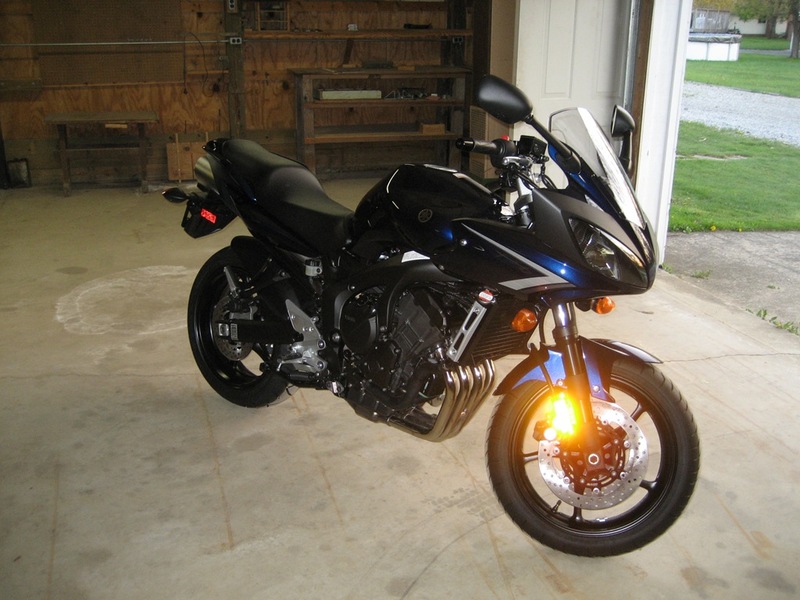 After hearing that… started taking to the dealer at Honda East Toledo and a week later I had a bike! So here’s what I got. 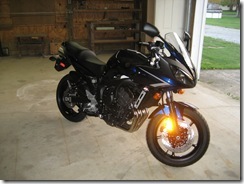 A brand new 2008 Yamaha FZ-6 600cc naked sport bike. So far… I’m loving it! It was a little nerve wracking getting on the thing at first. The bikes in the class weighed about 250 lbs. This thing weighs a little over 400 lbs and has about 4 or 5 times as much power! I really felt uneasy putting that much weight into a lean, but now it’s feeling real nice! It so much fun! And it’s fast! I’m still in the break-in period so I haven’t really pushed it into the power band yet. Still, taking it up to 7,000 RPM of it’s 14,000 RPM redline range while accelerating, it’s faster than most cars out on the road! Once break-in is done… I’m gonna really have some fun! Well enough babbling. Click here to see more pics of it.